According to The Sun, Arsenal are closing in on an £8 million deal for Salomon Kalou, the Chelsea forward. The Ivorian has been linked on and off with a move to the Emirates since January, and the tabloid claims that Arsene Wenger has already had a £6m bid rejected. Despite a promising pre-season under Carlo Ancelotti - following a good finish to last term with Guud Hiddink - there are still question marks regarding Kalou’s long-term prospects at Stamford Bridge. The arrival of Yuri Zhirkov, the revival of Florent Malouda and the impending return to fitness of Joe Cole could see the young ex-Feyenoord star relegated to the outer once more. 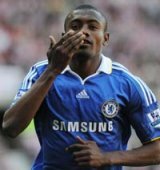 Thus, Arsenal are supposedly prepared to sign Kalou on a five-year contract with wages of £60,000 per week - roughly twice what he presently earns at Chelsea. There is no word from either club on this matter as yet, although the player himself admitted earlier this year that he was a big fan of Wenger’s management style.